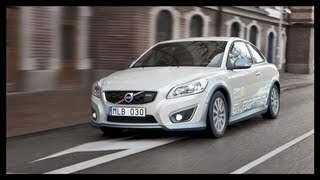 With Volvo C30, Volvo takes a step closer to building battery powered electric cars. Volvo is aiming at getting a test fleet of 50 C30's on road by 2011. 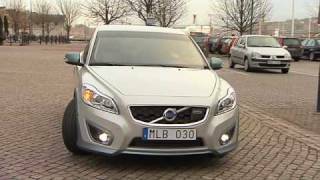 Volvo C30, to be unveiled at Detroit Auto Show 2010, will have a range of 150 kms on full battery and takes less than 8 hours to have a fully charged battery with regular power socket. With 82kW and 111BHP engine output, C30 sprints from 0 to 100 km/h in 10.5 seconds. Volvo Cars will unveil the next-generation battery electric powered Volvo C30 at the Detroit Motor Show in January 2010. The C30 on display will present a step further in the development process from the driveable electric prototype which was presented in September 2009. The new battery electric C30 features a complete interior and full instrumentation, as well as enhanced battery packaging. 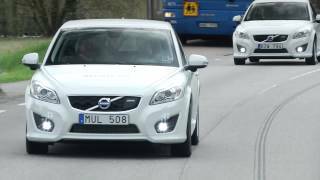 The electric C30 looks like a regular Volvo C30 and offers the same safety, comfort, space and four seats as the standard car. A pure electric car has different characteristics compared to a car with an internal combustion engine and the test fleet will give Volvo experts the opportunity to study how users handle these differences. The electric C30 looks like a regular Volvo C30 and offers the same safety, comfort, space and four seats as the standard car. The most obvious difference inside the car is the new instruments - the gauges and graphics are different to those in a conventional Volvo. The user-friendly combined instrument shows only road speed and energy consumption. However, it also integrates a number of new symbols such as a gauge for battery charge status and other relevant information for this type of vehicle. The driving experience is also different to that in a conventional car. The electric C30 has no gears and the motor's power is delivered seamlessly, with full power available immediately. "Sailing along almost silently is a very special experience. The power is there instantaneously. We need to spend a lot of time verifying a transmission system that is both comfortable and safe for the driver to handle and at the same time utilizes the battery's capacity optimally at different speeds," says Lennart Stegland. An electric motor uses about one-quarter as much energy as an engine running on fossil fuels. This superior energy efficiency suggests that interest in electric cars will increase as fuel prices rise and demands for low CO2 emissions become increasingly stringent. Top speed with a fully charged battery pack is about 81 mph. Acceleration from 0 to 60 mph takes less than 11 seconds. The car's range is up to 150 kilometres. This covers the daily transport needs of more than 90 percent of all motorists in Europe. When it comes to electric-only cars, there are several factors that determine their appeal in the future. "The consumers must feel that this type of car is attractive both to drive and own. That is why electric cars have to be as comfortable and safe and offer the same sort of performance as cars with other power sources," says Paul Gustavsson, Director of Electrification Strategy at Volvo Cars. He continues: "We believe in this technology and our field test aims to demonstrate that electric cars have considerable market potential. However, offering an attractive car is not enough. What is also needed initially is a system of subsidies to make the electric car's expensive battery technology financially viable for the car buyers. We hope that the authorities and the rest of the society will follow Volvo Cars in our "Drive Towards Zero" - Volvo Cars' journey towards zero emissions."